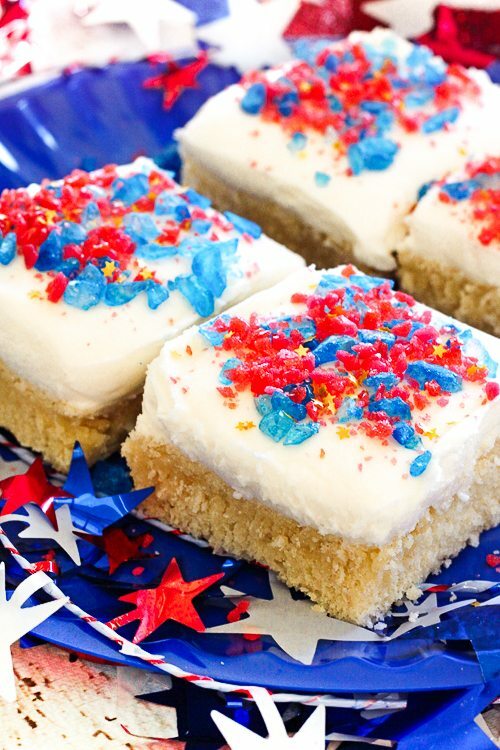 Firecracker Sugar Cookie Bars with cream cheese frosting are the perfect 4th of July treat. Candy Pop Rocks are sprinkled on top for an added surprise! 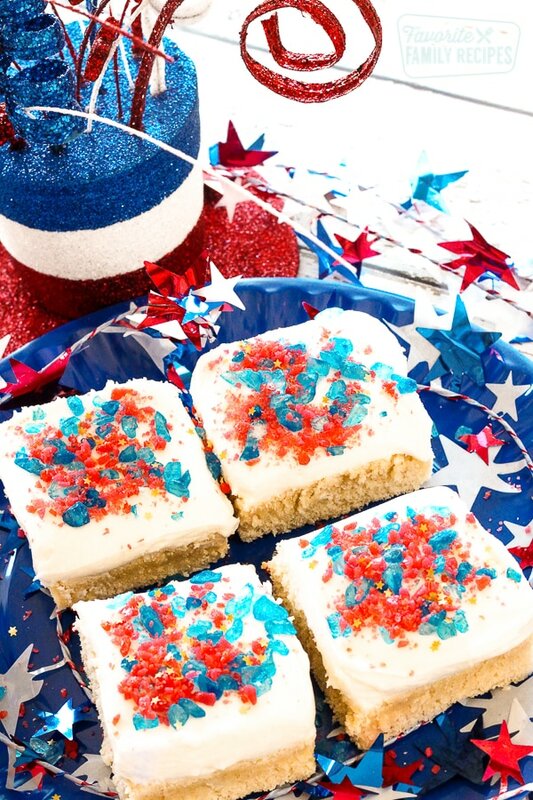 These Firecracker Sugar Cookie Bars are such a fun 4th of July treat! Kids are crazy about the Pop Rocks on top. It is like firecrackers popping in your mouth with each bite! I love making sugar cookie bars when feeding a crowd because they are just SO easy. You don’t have to scoop out perfectly sized dough balls and you can bake them in just one quick batch. Also, you don’t have to chill the dough at all when you are making these. You can just throw it all in the pan and bake right away. You don’t need the dough to be stiff to do cut outs so chilling just isn’t necessary. If you want to make things harder on yourself and make cut outs, that is totally ok, too. If you decide to go this route, after mixing, you will want to roll the dough into a ball after mixing and allow to chill in the fridge for little while. Remove from the fridge and roll out dough onto a floured surface using a rolling pin. Don’t roll them out too thin though– you want them to be chewy still. Use cookie cutters to cut out shapes (I have to admit, star shaped cookies would be SUPER cute for these). Bake at 350 for about 10 minutes. Don’t overcook or they will be too hard. Frost and top with Pop Rocks just as you would in this recipe. I used a combination of Pop Rocks, rock candy, and edible star sprinkles. If I could have found blue Pop Rocks I would have ONLY used Pop Rocks but I couldn’t find them at my grocery store this time so I got rock candy instead. I know blue Pop Rocks exist because I have had them before. They are usually in stores but I was just unlucky this time. If you plan a couple days ahead, you can order them online HERE. They are actually a really good deal online, cheaper than what I got them for at the grocery store. Plus, you can get a few extra to pass around for your 4th of July party. I’m sure you won’t have any complaints. Kids love that stuff! I found the edible star sprinkles (see above picture) at Hobby Lobby but you can also find them online HERE. Again, they are cheaper online than they were at my craft store. If I was smart and planned ahead I could have saved a little cash. Oh well, next time. Add eggs, milk and vanilla. Mix together until dough can hold together into a ball. Spray a 9x13 glass baking dish. Drop clumps of dough evenly around pan. Press dough down evenly with hands or spatula. Bake 15-18 minutes or until dough BARELY starts getting golden around the edges. Do not over bake! Beat together cream cheese, butter, and vanilla. Add powdered sugar to desired consistency. Spread over cooled cookie bars. 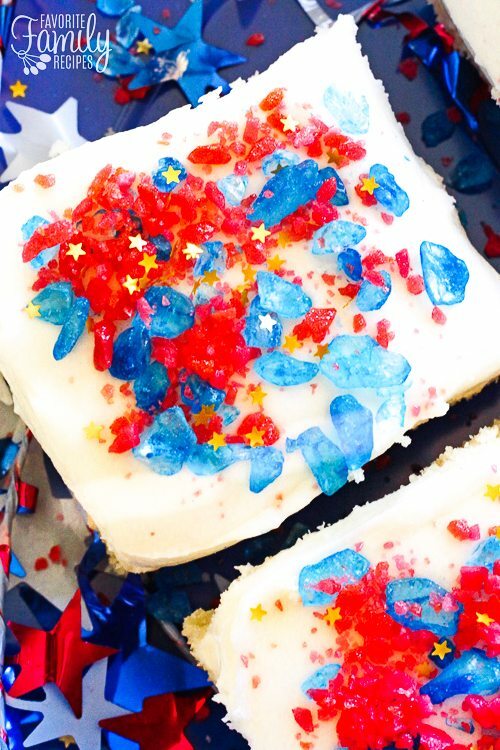 Cut cookies into squares and top with Pop Rocks and sprinkles. 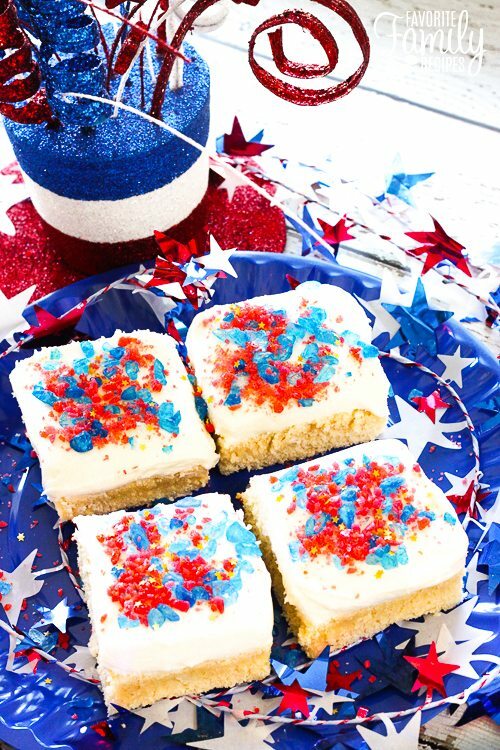 Patriotic Poke Cake: A red, white, and blue poke cake perfect for a crowd! Family Reunion Meal Planning Guide: Speaking of crowds, is your Family Reunion over the 4th? This meal planning guide will help you with everything you need for feeding a large group! Top 40 Grill Recipes: Planning on pulling out the grill before the fireworks start? We have 40 awesome grill recipes for you to choose from!